Having said this, I really have no specific fault to find with this show. Perhaps it’s a case of something you’ve built up in your mind to be so powerful being inevitably disappointing. The staging was minimalist, as befits a show about the stripped-down, unadorned story behind the scenes. The dancing was undoubtedly very tight and very slick, and a joy to behold. Cassie’s tortured solo, as she tried to express her frustration with both her impassive ex and her situation, was a powerful bit of dancing, and they did a little something with the lighting that made this part really stand out. There was plenty of humour, as there should be, and the characters were as fleshed out as they should be in such a dialogue- and character-driven musical. But with the word musical, I’m inching closer to the source of my dissatisfaction. Because, honestly, there was only a whisper of dissatisfaction. I’m “praising with faint damn”. It just wasn’t… musical enough. Not one of those vocal solos – and the show is basically all vocal solos – really had my spine tingling. The singers, though certainly competent, just didn’t seem that memorable. Remembering Jemma Rix in Wicked, and how her voice made me want to weep and made my skin prickle even the second time I saw the show, makes me realise that not one of these numbers moved me in the way I wanted. I waited and waited to hear Nothing, the song Diana sings, and look, it was good, but it just wasn’t great. And the dancing is all well and good, but the singing is what makes you really care about those people, and if you don’t really care, it’s a long time to sit and listen to emotional stuff. Happily, spine tingles eventually came… One was introduced slowly, almost spookily, and in general given the attention it deserves. 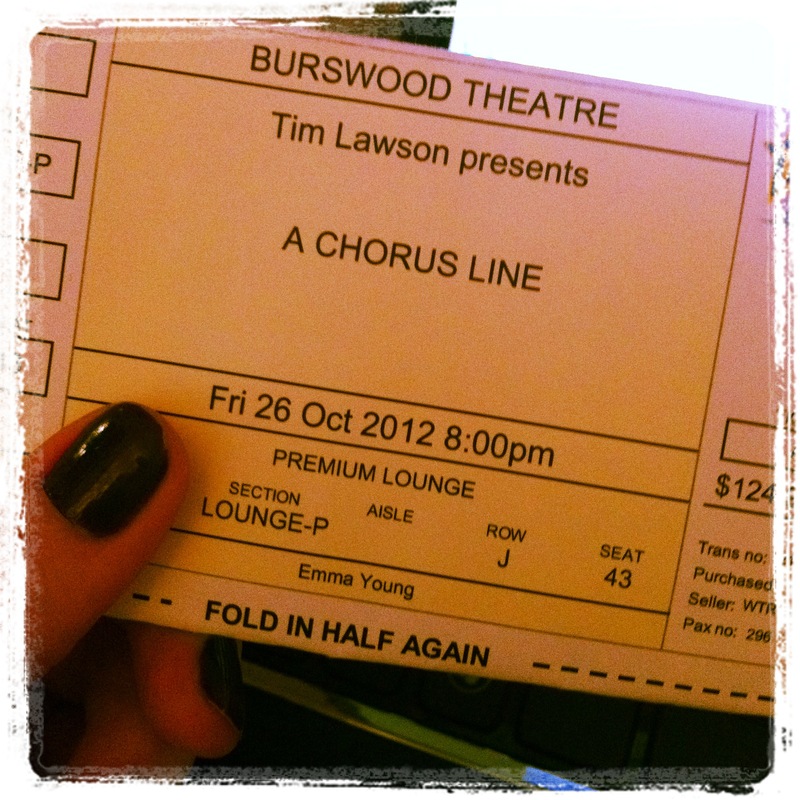 By the time the (damned fine) chorus line finally hit the stage, the Ministry and I started to wiggle in our seats and grin at each other. They did an awesome job on that ending, even down to working the performers’ final bows into it. Just seeing those high kickers strut their stuff made it all worth it, and I grin to remember it.